There are numerous conflicts ensuing in the Middle East, but not all are being fought with rockets and rifles. While the internet has proven invaluable to those who wish to uphold a patriarchal society and spread the message of Islamic fundamentalism, Muslim women have used the Web to build a transnational community intent on growing women's rights in the Middle East. There is a large disparity between a Muslim woman's role according to the Qur'an and her role as some corners of Muslim society have interpreted it. 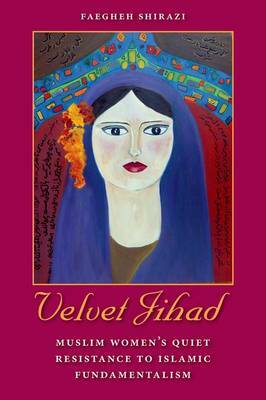 In ""Velvet Jihad"" Faegheh Shirazi reveals the creative strategies Muslim women have adopted to quietly fight against those who would limit their growing rights. Shirazi examines issues that are important to all women, from routine matters such as daily hygiene and clothing to controversial subjects like abortion, birth control, and virginity. As a woman with linguistic expertise and extensive life experience in both Western and Middle Eastern cultures, she is uniquely positioned as an objective observer and reporter of changes and challenges facing Muslim women globally.